I’m really trying to enjoy lighter meals especially now that we are already dealing with 90° temps. 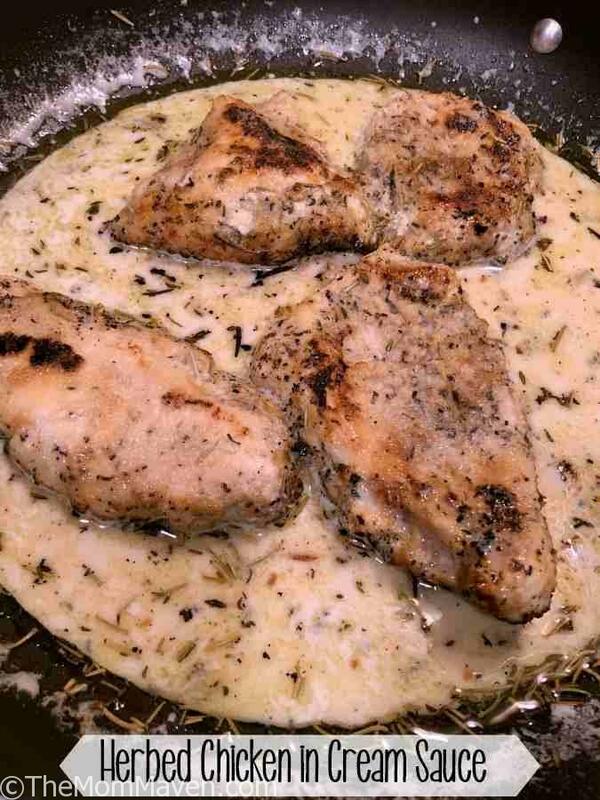 While I was searching for recipes I came across a cream sauce recipe that was used on fish, we don’t eat fish but I thought I could adapt it for chicken, and it worked. I served this my Herbed Chicken with Cream Sauce with a side of veggies but it would also pair nicely with a nice summer salad. Rosemary and Thyme are two of my favorite herbs so in this recipe I used them on the chicken and in the sauce. I thought the herbs might over power the rest of the dish but they didn’t. If anything I thought my serving could use more herbs, my husband disagreed, he said his was just right. 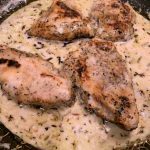 Herbed Chicken with Cream Sauce is a relatively easy one skillet entree the whole family will enjoy. Generously coat both sides of the chicken breasts with the spice/herb mixture. Heat 1 TBS of olive oil in a skillet or sautee pan over medium-high heat. Cook the chicken until it is opaque, approximately 5 minutes per side, turning every 2-3 minutes so it doesn't stick to pan. Removed cooked chicken from pan and place on plate to rest. While the chicken is cooking mix together , in a small bowl, the water and corn starch til smooth to make the slurry. Reduce the heat to medium, add another 2 tsp of olive oil to the pan and sautee the garlic, rosemary, and thyme until fragrant (about 1 minute). Stir in the milk, add salt and pepper to taste. Bring to a boil, add the slurry and whisk until the sauce thickens. Reduce heat and simmer until any starchy taste has been cooked away, about a minute. Add the chicken back into the skillet and coat it with the sauce. Serve immediately. My fiance love chicken, i will definitely try this recipe for him. Thanks!